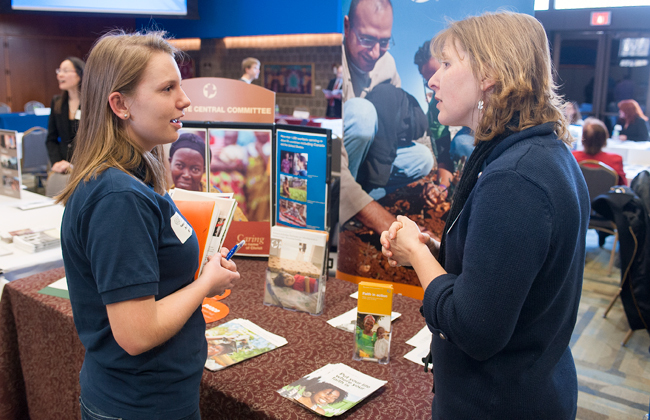 Villanova University student Sarah Garwood (left) discusses career opportunities in global development with Susan Wadel of the Mennonite Central Committee East Coast, one of dozens of organizations present for the Global Development Day April 2 at Villanova University with Catholic Relief Services. Four years ago eastern Africa’s most prosperous region was facing a famine in the making. The cassava plant, whose potato-like roots form the staple diet for millions in the Great Lakes region of Kenya, Tanzania and Uganda, was under attack by a blight exacerbated by drought conditions. 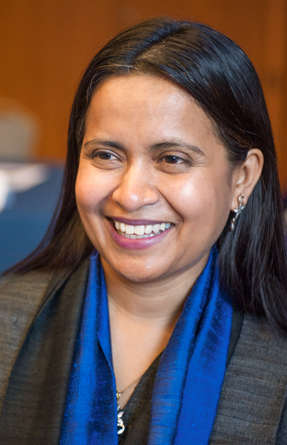 Catholic Relief Services began addressing the problem with one of its strongest assets, Chandreyee Banerjee, a young Indian woman working for CRS in Kenya. She organized researchers, local community partners, advocates and even information technology experts to implement solutions to the blight and enable continued cassava growth and harvesting. That is the nature of today’s international development work, and it was the focus of a Global Development Day hosted April 2 at Villanova University along with CRS, the U.S. Catholic bishops’ overseas relief and development agency. More than 160 students of Villanova and Cabrini College learned how to break into the field of global development and poverty relief through presentations by CRS staff and other agencies. Banerjee joined panelists for an opening presentation with CRS’ Global Director of Health and HIV, Shannon Senefeld, and Sean Moore, who works for a venture philanthropy fund. Senefeld spoke about how in the 1990s she joined a mission trip to Zambia in Africa and came away with two impressions. One, the prospect of large insects and scorpions in one’s bed was unpleasant. Two, many volunteers’ hearts were in the right place but their work was often ineffective because they stayed only a short time in a country. The immersion of CRS staff into a country for two to three years along with sometimes hundreds of national staff, made up of local residents, helps a director such as Senefeld to understand and address problems such as HIV and AIDS, malaria and other health concerns and organize and mobilize community partners and resources. Staffers learn intimately about the region’s culture and form lifelong friendships, according to Banerjee. The panelists agreed on the personal benefits of development work but also told the students that it is a constantly changing sector. One change she has seen in 13 years with CRS is shifting priorities of the U.S. government, which is a primary funder of health programs in developing countries, along with technological advances such as the video communications service Skype, and new challenges brought about by climate change. Another change was represented by the presence of Moore, who works for the Acumen Fund, based in New York with global offices. He described the firm’s work as “impact investing” in which it supports sustainable “critical goods and services” aimed at people who earn $2 to $5 a day. One example of Acumen’s investments was the development of a low-cost, low-energy solar lamp that might cost $8 but would replace the need for kerosene-burning lamps and their bad health effects, as well as circumventing the problem of limited or sporadic public electrical service in many developing regions. After the panel discussion participants led small-group breakout sessions to give the interested students more detailed information on their respective work. Other guest speakers led groups through topics such as “humanitarian engineering” specifically dealing with water supply and sanitation projects, plus advocacy to call for policy changes in support of global development. Students also had opportunities to review information and meet representatives of dozens of global organizations working in poverty relief in developing countries. Organizers of the Global Development Day pointed out that the impetus for it was the students themselves. Because CRS had formed partnerships with Villanova and Cabrini in 2005 and has offered programs and training of “ambassadors,” or student leaders for CRS, meeting the students’ desire to learn about career opportunities in development was a natural fit. “What we have seen in our work with universities is one, this strong desire for students to learn more about the role of the Church in these efforts; and two, to see what are the gifts, talents and skills they can bring,” said Maureen McCullough, CRS regional director who coordinates the organization’s activities in the Mid-Atlantic and Northeast region. Students throughout the day were encouraged to identify the work that excited them and then pursue that career, a point that made an impact on attendees. Zinn’s idealism was shared by her senior classmate Alexandra Andreassen, a sociology major who also has studied abroad at Oxford University in England. Villanova junior Matthew Hencken’s ambitions are not yet so well defined in terms of global poverty relief and development. But the chemical engineering major found a presentation on water and sanitation projects to his liking “but there’s a lot of other things like problem solving” that appealed to him, too. The main draw of the conference for him was “to get involved and see what engineering projects are going on around the world,” Hencken said. The interest of students and the ongoing work of CRS and its partners in the development sector inspired a key organizer for the conference. “It’s so important because students need something to believe in and CRS, I think, represents the very best of the Church,” said Suzanne Toton of Villanova’s Office of Mission and Ministry in the College of Liberal Arts and Sciences, which was a sponsor along with the Center for Global and Public Health in the College of Nursing, the Villanova Career Center, the University Partnership with CRS and the Center for Global Leadership in the Villanova School of Business. “Being exposed over the years to the partnership, seeing lay people who have expertise in agriculture, in trauma, in health, there are opportunities to use your education and your skills to address these cases of suffering and reduce the needless misery and needless death,” Toton said. The conference is not the only engagement of CRS with campus life, according to McCullough, the regional director. 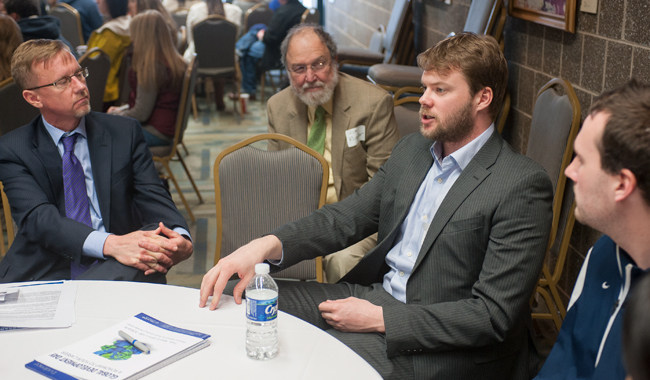 Sean Moore (second from right), senior portfolio associate with the venture philanthropy firm Acumen Fund speaks to Villanova students and Villanova School of Business professors Jonathan Doh, left, and James Klingler at the Global Development Day April 2 at Villanova University with Catholic Relief Services.